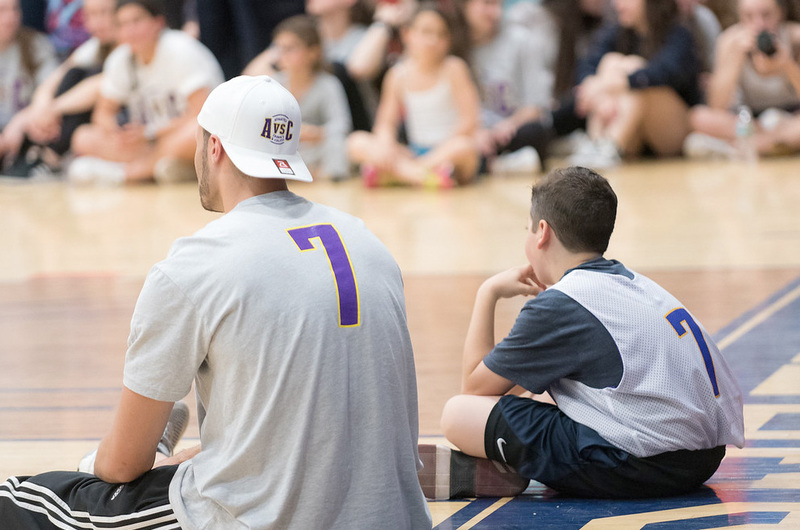 We are recognizing special young athletes battling IBD who refuse to let their disease hold them back from their goals both on and off the field. Click on the picture to meet our teammates and see how you can nominate an athlete to be featured. 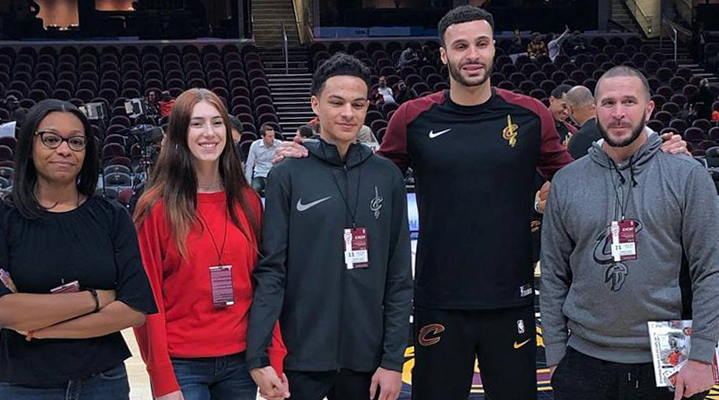 AVC kicked off our “Larry’s Leaders” program, in partnership with the Cavs and Cleveland Clinic, in which we host pediatric IBD patients for a night out at The Q! We are so happy to add Jamir (pictured) and the other Leaders to the AVC family! We are topping off Crohn’s & Colitis Awareness Week in a BIG way — these awesome billboards can be found in Northeast Ohio. We love sharing our story and raising awareness for kids battling IBD! 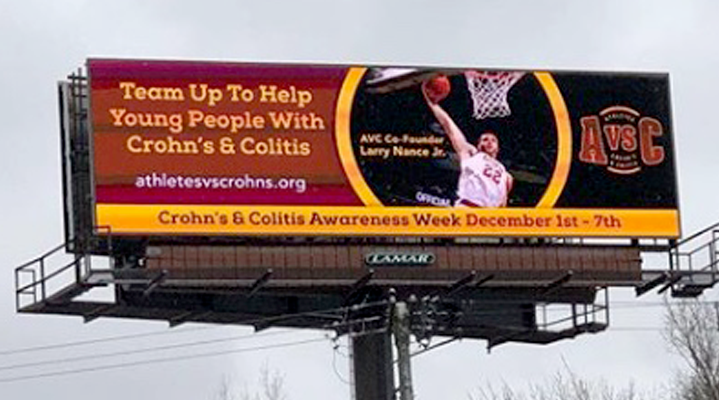 Athletes vs. Crohn’s & Colitis was founded in January of 2017 by Larry Nance Jr. and Noah Weber. athletes and both sought mentors with Crohn’s disease who reached their athletic potential. Together they hope to connect young people afflicted with Crohn’s and colitis to athletes to inspire and mentor. 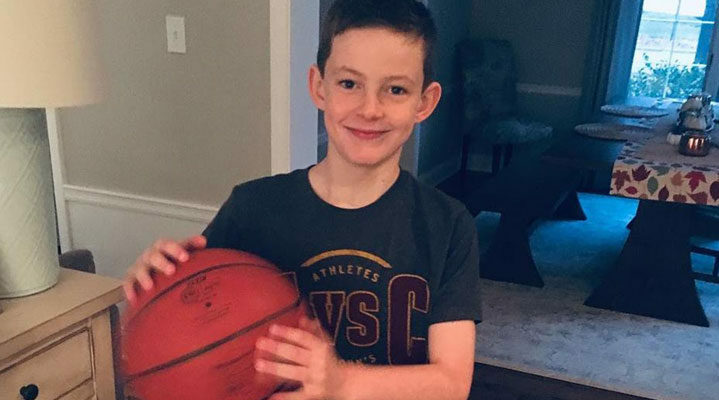 Click here to read Noah’s impressive story and see how he met Larry Nance Jr,. Click here to see Larry’s story and how he became the powerful athlete that he is today. Noah and Larry recently gave out their second annual scholarship to Hunter Moran, a standout volleyball player at his high school who was diagnosed with Crohn’s at age 13. Their first scholarship went to Joe Contino, a high school senior football player with Crohn’s disease. Both athletes are pictured here with Marla Dubinksy, MD of the Susan and Leonard Feinstein IBD Clinical Center at Mount Sinai, Noah and Larry. Congratulations Hunter & Joe for displaying courage, resiliency, and refusal to let IBD hold you back from reaching your goals! realize their athletic potential despite being diagnosed with a chronic illness. Copyright © 2019 Athletes vs Crohn's and Colitis. All rights reserved.